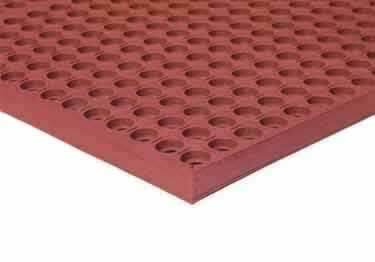 The functional Workstep Mat is a lightweight rubber drainage mat that is both easy to handle and clean. It features an enhanced anti-fatigue design for greater comfort with molded beveled edges for added safety. The functional WorkStep Mat is a lightweight rubber drainage mat that's both easy to handle and clean. It features an enhanced anti-fatigue design for greater comfort with molded beveled edges for added safety. Indoor/outdoor shoe scraping floor mat. Made of rust-proof galvanized steel.